“Electricity” is the long awaited collaboration between production duo Silk City (consisting of industry veterans Mark Ronson & Diplo) and Dua Lipa. 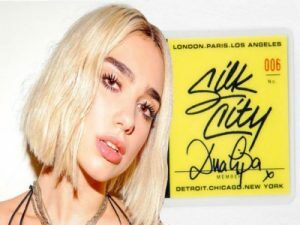 The song was first teased when Dua Lipa was seen in the studio with Silk City in January 2018, and confirmed after Silk City dropped their debut single “Only Can Get Better” in May. Mark Ronson later revealed the title in an interview with The Times magazine, complimenting Dua Lipa’s voice: She has this deep, soulful voice that harkens back to gospel house.